INTRODUCTION: Most hernia repairs today are performed with the use of a synthetic prosthesis. However, mesh infection continues to represent a potential major complication that can lead to significant patient morbidity and recurrence. The search for mesh products that are able to reduce or inhibit microbial colonization is ongoing. 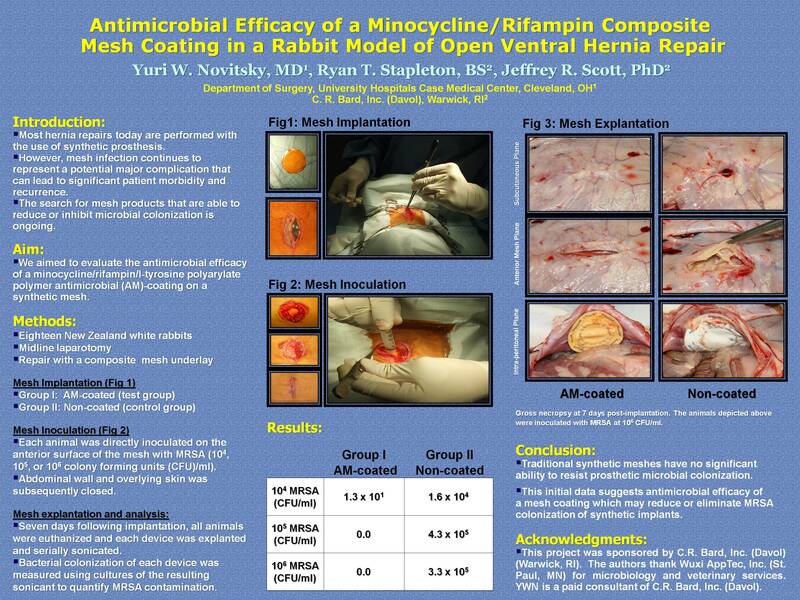 This study was designed to evaluate the efficacy of a novel (minocycline/rifampin/l-tyrosine polyarylate polymer) antimicrobial (AM)-coating on a synthetic mesh implanted in a controlled inoculated site in a rabbit ventral hernia model. MATERIALS and METHODS: Eighteen New Zealand white rabbits underwent an open intraperitoneal midline implantation of a synthetic composite mesh with (Group I) and without (Group II) the novel AM-coating. Following implantation, all mesh implants were directly inoculated with various concentrations of methicillin-resistent Staphylococcus aureus (MRSA) 104, 105, 106 colony forming units (CFU)/ml; (3 animals per inoculum). Seven days following implantation, all animals were euthanized and each device was explanted and serially sonicated. To evaluate bacterial colonization of prosthetics, the resulting sonicant was cultured to quantify the number of MRSA CFU/ml harvested from each device. RESULTS: All animals survived the duration of the experiment prior to euthanasia. Group II demonstrated significant bacterial colonization, as evidenced by harvested MRSA from all 9 mesh samples (104 MRSA: 1.6 x 104 ± 1.3 x 104 CFU/ml; 105 MRSA: 4.3 x 105 ± 1.7 x 105 CFU/ml; 106 MRSA: 3.3 x 105 ± 1.8 x 105 CFU/ml). The AM-coated group demonstrated a dramatic reduction and/or elimination of MRSA from all 9 devices (104 MRSA: 1.3 x 101 ± 1.3 x 101 CFU/ml; 105 MRSA: 0.0 CFU/ml; 106 MRSA: 0.0 CFU/ml). CONCLUSION: Traditional synthetic meshes have no significant ability to resist prosthetic antimicrobial colonization. This initial data suggests antimicrobial efficacy of a mesh coating, which may reduce or inhibit MRSA colonization.